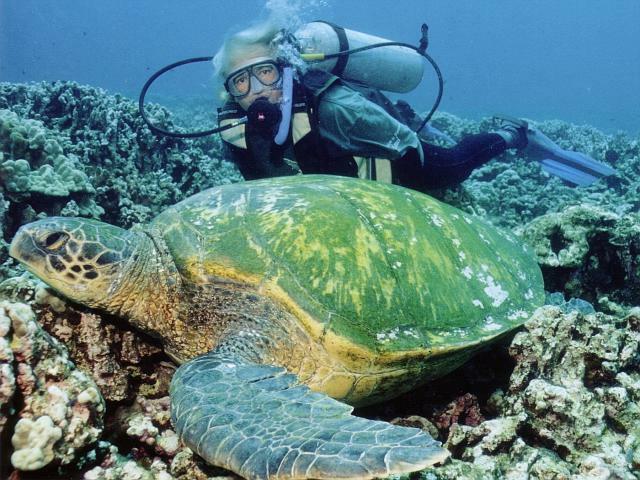 This essay was written by Ursula Keuper-Bennett to express gratitude to Mississauga's River Grove Community Centre for the huge part it has played in transforming us into fit, healthy divers who can continue to dive with the honu--and in saving my life. It's been exactly one year this week since I joined River Grove. I've lost exactly 80 pounds--the Big 8-OH. Exactly. This was all forced on me. It's my husband's fault. You see, it was also a year ago that my husband developed two blockages in his coronary arteries and we spent New Year's Eve in the cardiac unit of Credit Valley Hospital. Peter with C. mydas on the Cardiac Ward of Credit Valley Hospital. No, that is not a pillow under his gown. I've never been so frightened. His doctors and nurses walked around looking very serious, even grim. It was clear that my husband had been a hair's breadth from a heart attack. That's the accumulated effect of decades of eating and doing nothing. 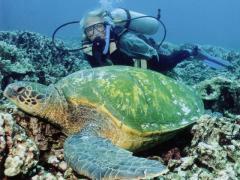 Peter had a successful angioplasty but our main concern was whether he could SCUBA dive again. 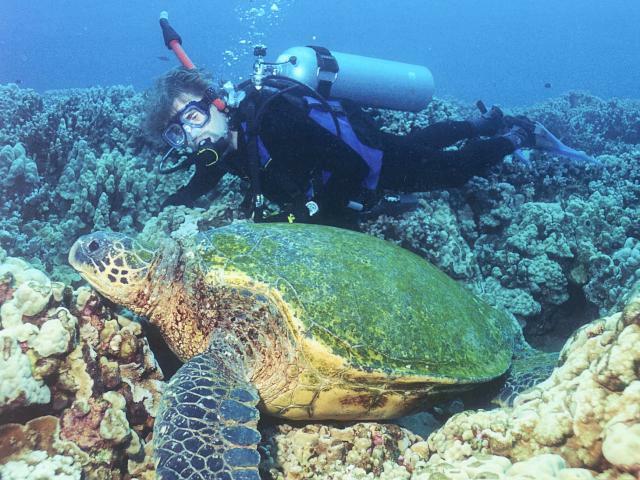 We dive with sea turtles and we love them. 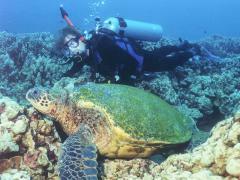 Peter's cardiologist, Dr. Strauss, told Peter that if he could pass a stress test in May he'd be given clearance to dive. It was possible to see with our sea turtles again! Talk about a BRASS RING! We were told all Peter needed to stay healthy was to walk briskly three or four times a week, but to dive, he needed to complete Stage Four on a stress test. That meant we had to train for Stage Five! I knew this meant exercise and because it was winter, we needed something indoors. That's when I remembered we had a community center nearby. So we signed up at River Grove. Talk about palatial! What a beautiful facility--especially the pool, with its glass wall looking out on a grove of tall pines, but we knew we it would be the treadmills upstairs that would either make or break us. At the beginning it was tough for me to walk at 2 mph for even five minutes! My shins protested. I could only handle three minutes of Level 1 on the StairMaster. The slightest exertion brought on rivulets of sweat. We knew we were doomed to a "life sentence" of sweat, treadmills, StairMasters, LifeCycles and other exercise paraphernalia. Still, it didn't take long to realize that if we were "sentenced to life" then we'd truly lucked out to spend our days at River Grove. We were beginning to make friends and it quickly became obvious how crucial a support system is to success. We also realized River Grove Fitness Centre isn't limited to "exercise freaks." There were also people just like us--fellow "inmates" fighting various chronic illnesses from diabetes to their own propensity for eating and doing nothing! If Misery truly loves Company then we sure had the Company! It didn't take long for us to bring in music--we'd made up our own CDs with our favourite tunes. We had treadmill music and biking music and recover-your-breath music, and the music went a long way to toning down some of that "misery". It didn't take long for some success to make exercise seem a whole lot brighter too. Pounds were coming off but even more important, we could not only do a brisk walk but also sustain that at a 15-degree incline. OK, maybe for me it was only for four minutes, but that was inconceivable just a few weeks before. As for Peter, he knew every minute spent at River Grove was his way of fighting back the demon of cardiac problems. Always, our sea turtles called to us. Always they were front and center in everything we did while at River Grove. Over the years we'd dug ourselves on huge hole with our self-destructive ways--but we knew we were crawling out! By now there were people we'd expect to see every day--the same reassuring faces. We'd notice if one would be missing for a few days. We were always happy to see a friend return. There was kidding about arriving late. There was even kidding about arriving early. It became clear that River Grove wasn't just about exercise--it was about people. The staff of course, was supportive, and this support started on the main floor with Reception. Of all the staff, though, it was Paul who never failed to answer a question--and answer it thoroughly. When your husband has a cardiac problem, it was reassuring to find out that Paul was fully trained in emergency procedures too. While on the treadmill I was able to see into the gym room. I'd watch the exercise classes but I knew I was too heavy and out-of-shape to even consider signing up. Then I heard about a toning class. No dance steps and extreme jumping up and down--but still exercise. Looking back I now know that it was signing up for the 10:15 Tuesday toning class that made the biggest difference of all. For one thing, just one session with Janet made me sign up for her Thursday Ball class as well! 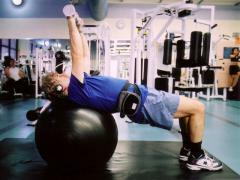 Ball class, like Toning, has little in the way of cardio--but TONS in the way of building strength. Peter implements lessons passed on from Janet: chest presses on the stability ball! In her classes Janet stressed the importance of "building the core," "strengthening the core." It didn't take long for me to realize that these two classes got rid of a back pain I'd nursed for close to two years and helped improve a knee problem that had limited progress in my cardiac sessions. Janet would also explain the purpose of each exercise--what muscle group it was targeting and why. Best of all, she'd provide different "levels" for each exercise--an easier way, or how to do something more advanced. That's a pretty good trick in itself to provide quality instruction for all ability levels. There's something else I credit Janet with. Every class she'd encourage us to use the weight room. Of course at first I ignored her, but once she told us that muscles are the "furnace" part of our bodies--the metabolism "ally"--I made my first venture into the weight room. I'd learned that muscles are active and burn calories. More muscles mean we can eat more calories a day without gaining weight. I realized that more muscles could actually help me lose weight! I started out using the Universal Machines. As I worked these I'd watch what was happening in "Testosterone Alley." Testosterone Alley was what I called the free weight area where most of the males hung out. I read somewhere that it's best to use the Universal Machines to gain confidence before attempting free weights. I actually gained the confidence in Janet's classes. She'd work us with free weights and target all our muscle groups. She continued to encourage us to try the free weights in the weight room. One day I did. The first thing I learned was that the males weren't just males but were also gentlemen. It didn't take me long to figure out which males knew how to work weights properly, so I just watched them train. I even asked them questions and got excellent advice and even instruction on occasion. 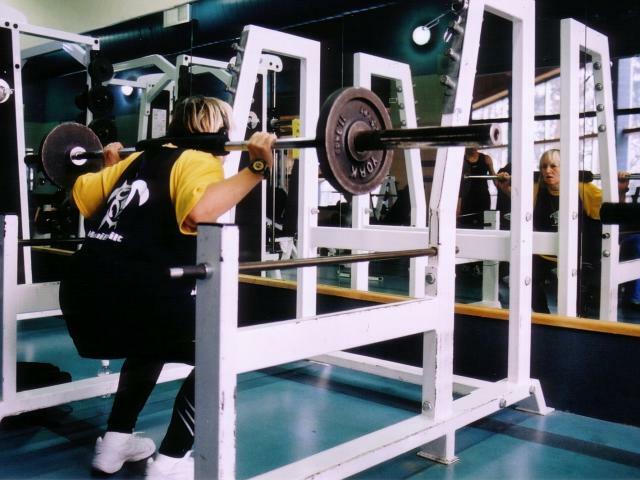 Doing 50 pound squats with the Olympic bar is guaranteed to to strengthen the back and legs. While I really enjoy being able to run again--I hadn't run since I was a teen--and delight in the progress I've made in core strength thanks to Janet, it's losing myself to the free weights that I really love. Testosterone Alley was at one time intimidating for me. Now I find peace there. Under my headphones, listening to my "free weight music," there's only iron and gravity and muscles getting stronger. The number one thing I learned about losing 80 pounds in a year is that it isn't just a physical thing. Losing weight and lifestyle changes aren't just about Body. A whole lot of Mind has to be involved. Reading/research about fitness and exercise was important too. Ironic how a coronary event that looked to be the End turned out to be a new Beginning. My husband is healthier now after his angioplasty than he's ever been--and me? I've never been more fit in my life! That's not bad for Flower Children who'd let themselves go to seed. I keep telling people how lucky we are. We live three minutes away from Credit Valley Hospital and four minutes from River Grove. I'm ending this essay with two special pictures. The first is of Peter from last summer. 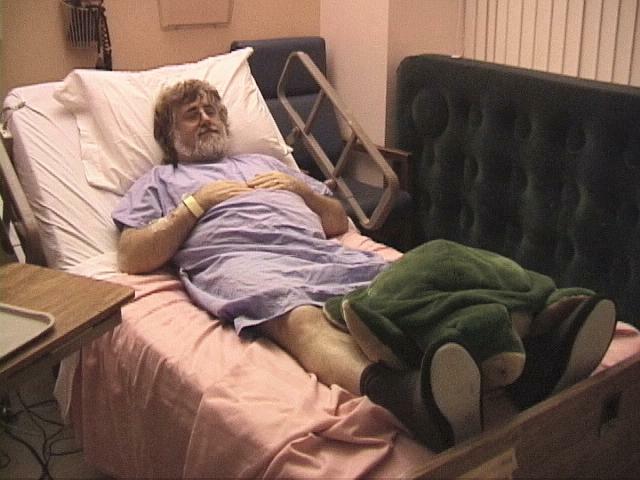 It was taken just six months after his angioplasty. The sea turtle's name is Zeus. We've known Zeus since 1992. The second shows me with Ho'oulu (Hawaiian meaning "to inspire, excite"). This is why we worked so hard at getting fit. Our sea turtles call to us. There's the kind of living you do where you breathe in and out and eat and sleep, but being underwater with these creatures is Being Alive! We are so grateful to River Grove for the support we've received this past year.